Water and electricity don’t mix. This old adage is as true today as the day it was first said. You don’t want water getting into your home’s electrical system. That’s why electrical plugs are not installed within a certain distance of sinks, tubs, and showers, But, can a leaky roof cause electrical problems? Leaks can occur in many locations on a typical roof. They can happen in the field of shingles, in the valleys, around chimneys, around pipe vents, and along the edges of flashing. When a leak occurs above or near an electrical fixture, outlet, or junction box, the potential for an electrical hazard goes up. A steady drip of water can flood an attic floor, seeping down into light fixtures below. It can drip down into walls and get into outlets. It can infiltrate junction boxes, exposing water to live wires. In extreme cases, it can get into the electrical panel, corroding wires and causing very dangerous conditions. 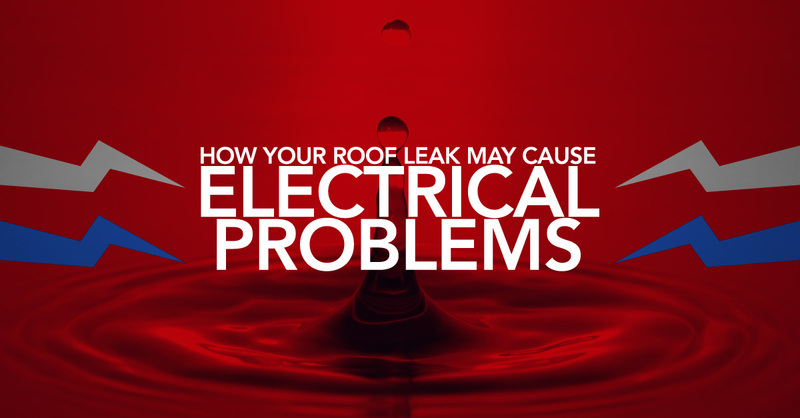 Here are a few signs you might have an electrical problem caused by a leaky roof. If you suspect your leaky roof is causing electric problems, you must take action immediately. Don’t wait because the longer you delay, the longer the danger exists. Turn off the electricity. If the circuit panel is dry, turn off the power there. If not, do it at the exterior switch outside. Call an electrician. When you are dealing with the mix of water and electricity, leave it to the professionals. Call a roofer. You need a pro to find the leak and get it fixed as soon as possible. Why take immediate action? When electricity and water meet, it can cause sparks which can, in turn, cause a fire. The water also gets electrified when they meet, creating an open circuit. An open circuit can cause dangerous shocks if a person touches an outlet or wire. If you need a roofer to come out to check for leaks and make repairs, call Mark Kaufman Roofing today.